Hey there! It’s a cold February day, and when it’s like this, nothing beats a nice big pot of soup warming on the stove. Am I right? Over the last few weeks, I’ve been sharing some of my favorite one-pot meals and comfort food classics. 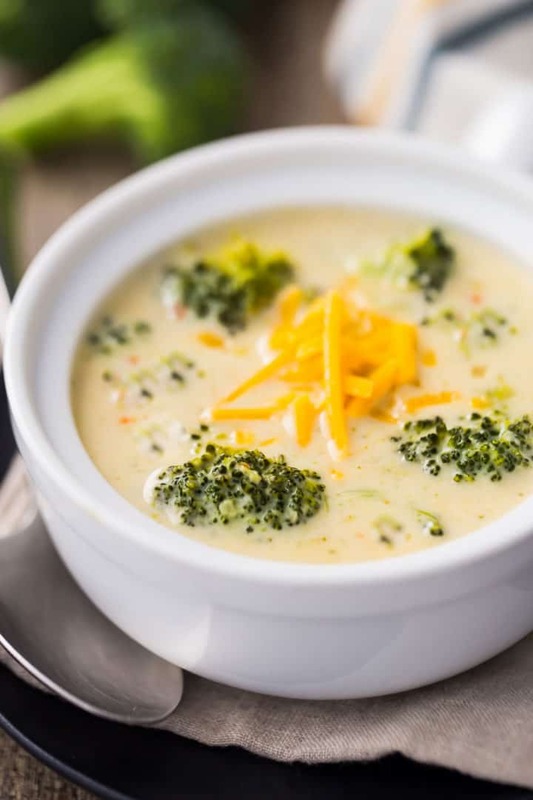 We’ve talked about chili, and chicken pot pie, and now today I’m bringing you this easy broccoli cheese soup. It’s creamy and cheesy and hearty, and my whole family goes gaga for it. My older son especially asks for it often, so it’s on heavy rotation at my house, particularly when the weather is cold and blustery! To make this yummy soup, start by sauteing onion and shredded carrot in a little oil. When you see the veggies are starting to become a little softer, sprinkle them all over with flour. The flour will combine with the oil and create a roux, which will thicken the soup. Stir everything around for a minute or two, cooking out the rawness of the flour, then slowly drizzle in the chicken stock, while continuing to stir. Bring the mixture up to a simmer, then turn the heat down to low and add the cream. The soup should be hot and steaming, but not boiling. If it gets too hot it could curdle the dairy; there’s more on that below. Add the cheese, a handful at a time, stirring after each addition. Make sure each handful of cheese is completely melted and incorporated before you add the next bit. Once all the cheese has gone in, you can add the broccoli. 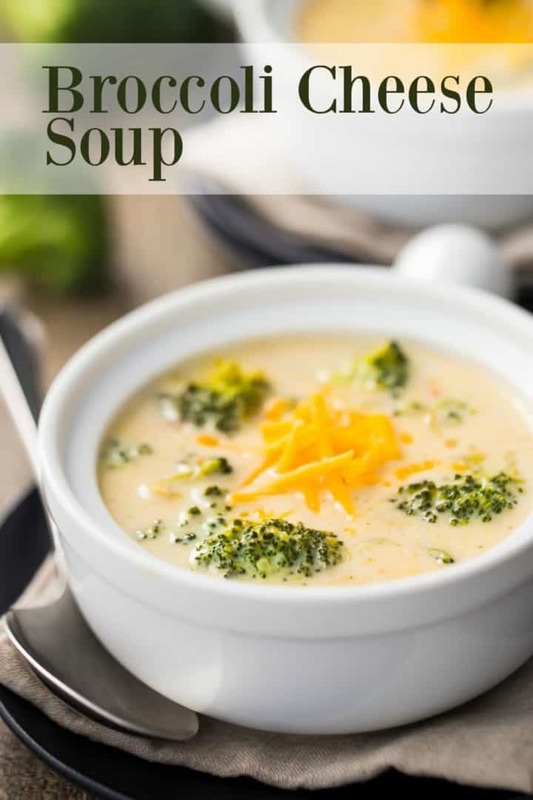 Make sure your broccoli is not cold, otherwise it will bring the temperature of the soup way down and the cheese will become gloopy. If you like a thicker soup, use a hand blender to puree some of the veg. This will add more body to the soup, but I like to just blend it a little bit, leaving plenty of big chunks of broccoli too! Now just keep the pot on a very low flame until the broccoli has softened to the texture you like. For me this takes about 20 minutes, but if you like it softer, it may need a bit more time. To me, a meal like this calls for carbs. I love a good hearty bread with a bowl of soup! Some of my best suggestions would be these crusty French baguettes, these homemade crescent rolls, or these buttermilk biscuits. If you’d like to make a vegetarian version of this soup, just swap the same amount of vegetable stock for the chicken stock. 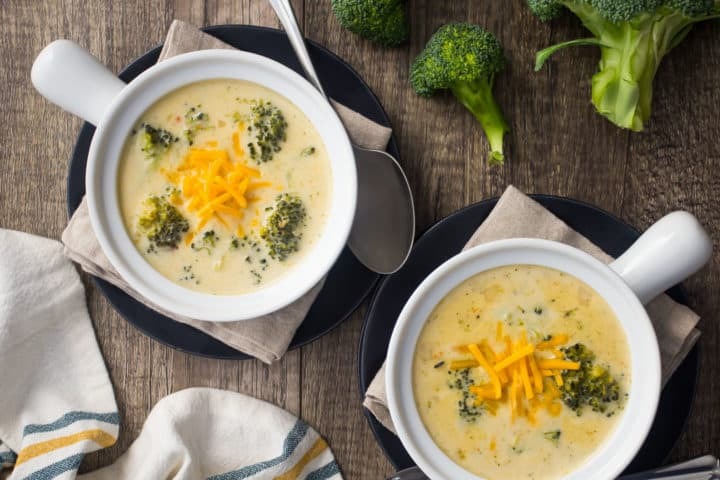 For a gluten-free broccoli cheddar soup, use 1 tablespoon of cornstarch in place of the flour. TROUBLESHOOTING: WHY IS MY BROCCOLI CHEESE SOUP GRAINY OR CURDLED? This can happen if the temperature gets too high. Basically the proteins in the cheese tighten up and squeeze out the fat. You end up with a grainy, curdled consistency. Unfortunately there is no way to fix it once it’s happened, so just be really careful to keep this soup on a very low flame once the dairy has gone in. If the soup remains hot and steamy, without boiling, it will stay beautifully silky and creamy. 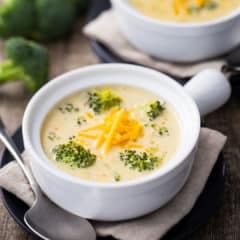 HOW LONG IS BROCCOLI CHEESE SOUP GOOD FOR? If you have any leftovers, just seal them in an airtight container and pop it in the fridge. The soup should last for at least a week, maybe even longer. If it starts to look or smell off, then you should toss it. You can also freeze it! To thaw, place the container in the fridge a day or so before you plan to eat it. The name of the game here is “low and slow.” To avoid that grainy texture, you have to be really careful not to let this soup get too hot too fast. It can be reheated in a pot on the stove, or in a bowl in the microwave. If you choose to reheat it on the stovetop, just keep that flame really low and stir it often. If you prefer to use the microwave, hit it with short bursts (around 20 seconds), and stir after each, until it reaches the temperature you like. If you’re searching for an easy weeknight meal that’ll warm everyone down to their toes, look no further than this broccoli cheese soup recipe! It’s so good with a hunk of hearty bread, and it’s always a big hit, especially on a cold winter night! Heat the oil in a large, heavy-bottomed pot over medium-low heat. Saute the onion and carrots until slightly softened. Sprinkle the flour over the onions and carrots and stir to coat. Stir in the chicken stock, slowly. Allow the mixture to come to a simmer, then stir in the cream. Stir in the broccoli, season to taste, and allow the soup to continue cooking* until all the vegetables are tender. Optional: use a stick blender to puree some of the vegetables, while still maintaining a few bigger chunks. *Do not boil the soup or it could curdle and split. 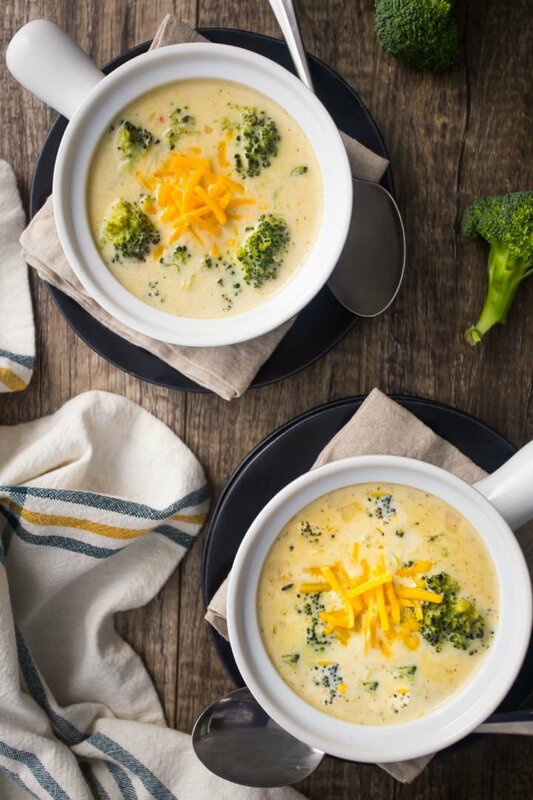 My little one loves broccoli cheese soup, and I’m so excited to find your recipe! Yum! What weight of cheese is equivalent to 3 cups shredded? Hey there! That would be 12 ounces. This soup looks so good! Will be making it tonight! Hooray! Hope you love it as much as we do!